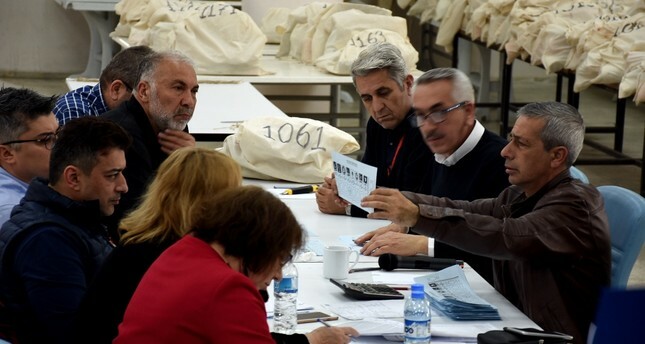 Representatives from various political parties and the YSK recount votes in the Şişli district of Istanbul, April 5, 2019. The recent municipal election in Istanbul was deeply marred by irregularities and traces of organized crime were also found, President Recep Tayyip Erdoğan said Monday ahead of his departure for a meeting with Russian President Vladimir Putin in the Russian capital Moscow. "The irregularities are not some, but almost all. That's why such a procedure is being conducted. The election process is over. The ongoing process is [a] legal process. Patronage of the legal process is under the control of the YSK [Supreme Election Council]," Erdoğan emphasized, aiming to explain the process of the post-election period that has led to misinformation, particularly on social media. While in many provinces election results have already been declared, in Istanbul, which saw a tight race, the case is not the same. There have been reports of irregularities and unregistered votes by the parties. The unofficial results showed the main opposition Republican People's Party (CHP) candidate, Ekrem İmamoğlu, leading in the mayoral race in the Istanbul Metropolitan Municipality against ruling Justice and Development Party (AK Party) candidate Binali Yıldırım, who was deemed the favorite by many in the race ahead of the elections, by a small margin of about 22,000 votes. There were 10,570,939 eligible voters in Istanbul, and voter turnout was 83.88 percent. Addressing reporters Monday, AK Party Deputy Chairman Ali İhsan Yavuz said the AK Party has gained 5,069 votes from invalid votes alone, reducing the gap between the two parties to nearly 14,000. Yavuz also presented some documents that prove irregularities and unregistered voters in the district of Büyükçekmece. Erdoğan also said that there is footage of irregularities being committed during the election and added: "Citizens say 'protect my rights.' Because, they say that they observed organized crime being committed there. We, the party, also detected organized crime committed and some organized activities. We will take steps on the issue." Saying that there have been examples of re-elections in Turkey and other countries, Erdoğan said it was impossible for the opposition candidate to claim victory in Istanbul by a margin of 13,000-14,000 votes in a city of 10 million voters. "There are nearly 320,000-330,000 invalid votes. If you say 'we cannot make the count of this,' there is another option within the borders of law. It is our most basic right to expect this from the YSK. There have been past examples of this in Yalova and Ağrı," said Erdoğan, referring to a possible re-election appeal and also added that there were re-elections in the United States due to narrow margins. A similar case took place in Florida once again in 2018 during the Senate elections, where the votes were recounted two times in two weeks. The 2016 presidential elections witnessed recounting incidents more than once. One of them took place in the state of Nevada, while others took place in Michigan and Wisconsin, where the votes were recounted on the objection of the Democrat candidate Hillary Clinton. As a result, in Wisconsin, Clinton's rival Donald Trump increased his number of votes. Another example of recounting took place in Austria during the 2016 presidential elections as the votes were reassessed with the claims that there were some "major irregularities." Similarly, during the 2009 presidential elections in Romania, votes were recounted as a result of the objections by the country's Social Democrat Party. Responding to a question about whether the decision by the YSK will be the final decision, Erdoğan said: "Turning to the prosecution about organized intervention is another issue. There is also organized intervention in ballot boxes which is the reason we appealed to the YSK. It [the process] will be conducted in two dimensions. My wish is to finalize it in the best way." Meanwhile, YSK Chairman Sadi Güven said yesterday: "It is not possible for me to make a comment because the legal process is still ongoing," as a response to reporters' questions about what will be involved in the recounting process. The first appeal period, where parties file their objections for provisional results to the YSK's district election boards, ended last Tuesday. Following the evaluation of objections, the district boards had two days to announce definite district results. Provincial boards had one more day to announce the definite results after objections. After this, parties are able to object to district board results and apply to the provincial election boards of the YSK, which has two days to evaluate the second objections. If the parties object for the third time, then the provincial election boards can come to the YSK within three days. The YSK is expected to announce definite results within the month. The YSK is assigned – from the start until the end of elections – to manage the order of elections with honesty, to undertake or provide the undertaking for all necessary transactions, to examine all electoral complaints and objections and to give final decisions on such complaints, and to accept the electoral minutes of members of the Turkish Grand National Assembly and minutes of the presidential elections. AK Party spokesperson Ömer Çelik also told reporters Sunday that the party sees the YSK as the sole authority to decide definite results in the elections, adding: "After all elections in Turkey, political parties object [to the results] and the YSK decides on the results. Regardless of the outcome, we will respect the result declared by the YSK." Following applications to the district election boards, the AK Party Istanbul provincial organization applied on Friday to the Istanbul provincial election board for a total recount of all votes cast in the province in the local elections.